This post (another long one, sorry!) will be the final part in this series. I can always add to it later, if there is something that I didn't cover. 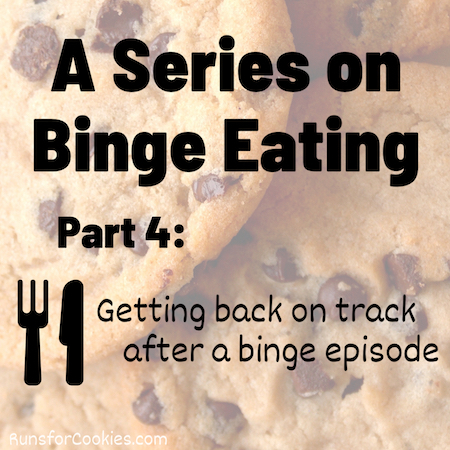 In Part 4, I thought it would be helpful to write about getting back on track after a binge, particularly by using a balanced eating approach that has really helped me as far as my binge eating disorder goes. I remember very clearly a conversation I had with Thomas, my BFF who lives all the way across the country, over the summer. I didn't know it at the time, but the advice he gave me would help me start and continue a long binge-free streak. 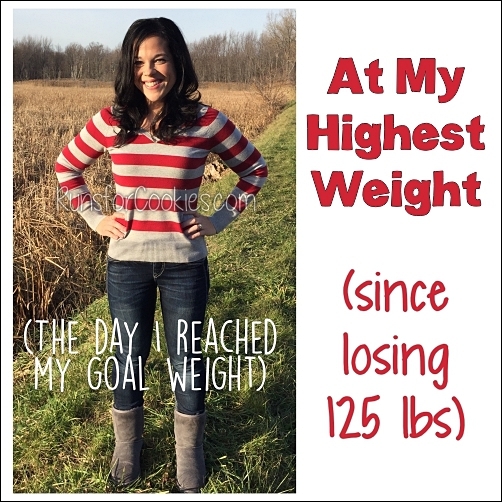 I had taken my kids to baseball practice, and while I was waiting for their practice to get done, I was thinking about how I'd let the weight gain get out of control and how desperate I was to get back IN control. His response was so very simple--almost too simple--but something I'd never really thought of as a solution before. You ready? Here goes: Balance. Thomas said that he got a feel for how much he should be eating, and how many calories were in his regular foods, when he was counting calories to lose weight. To maintain his weight loss, he now uses a balanced approach to eating (without counting anything). Here is what he meant by "balanced": If he ate a big breakfast, he would eat a smaller lunch and dinner that day. If he knew he was going to be eating a big dinner, he would eat a small breakfast and lunch. Likewise, if he had an indulgent day, then the next day, he would keep it minimal. So simple, right?! When I was counting Weight Watchers Points, that would never work out for me because once I went over my Points for the day, I just said, "Screw it! Might as well start fresh tomorrow, and eat everything in sight today." By having a very particular "cap" on the amount of Points (or calories) I can eat in a day, I am basically saying that anything over that number is failure. (I'm not saying all people have this issue--but it was a big issue for me.) In Thomas's balanced approach to eating, instead of saying "Screw it! Let's eat more!" after overindulging, he does the opposite--he eats lightly for the rest of the day to compensate. Now, I'm not going to kid myself--I know that I can't go without counting calories. 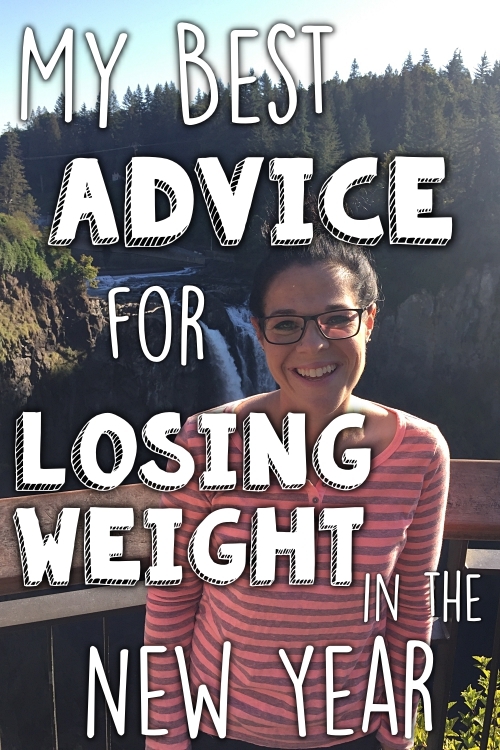 I've tried that in the past, with disastrous consequences (hello, 27 pounds! Good to see you again--not!). 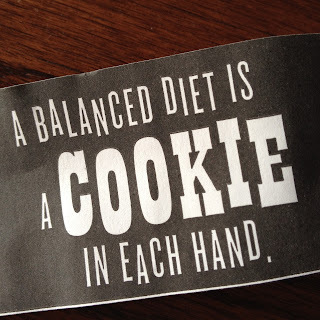 So, I use his balanced approach while continuing to count calories. I know generally how many calories I spend on each meal. Breakfast, for example, is usually about 300-350 calories. If I choose to have a higher calorie breakfast one day, like the breakfast we ate on Christmas Eve, that's nearly 600 calories--much higher than normal. So, I eat (and enjoy every bite) of the higher calorie breakfast, but I just plan lighter meals for lunch and dinner. On Eli's birthday, he chose to go to our favorite Chinese restaurant (for those of you local to me, I'm talking about Hawaiian Island in Trenton--so good!!). I didn't want to order steamed vegetables and rice; I wanted the good stuff! Sweet and sour chicken, egg roll, fried rice, etc. Since I knew we were going there for an early dinner, I ate minimal calories for breakfast and lunch, and I was able to eat what I wanted at the restaurant. I didn't "blow it" by bingeing, or using that high-calorie meal as an excuse to continue to eat when I got home. That meal (eaten at 4:00) was super filling. I ate enough to feel satisfied (slightly full), but I wasn't stuffed when I left the restaurant. I had a tiny piece of Eli's birthday dessert for a treat later that evening, and I was 100% satisfied that day. I didn't feel at all guilty about my choices, and I didn't feel deprived, either. 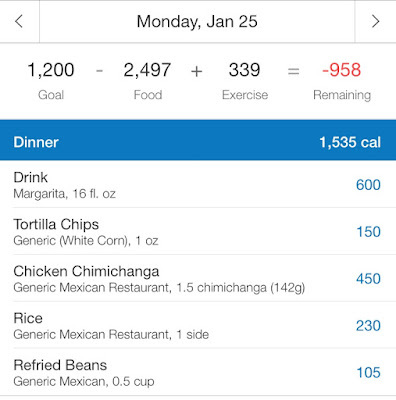 Another example is of a full day of higher calorie eating. Some days, I just feel like eating more than usual, or maybe I go out to dinner with friends and I spend more calories than I planned to. The following day, I don't force myself to stick to a strict calorie count, but I do try to keep it a little lighter, and eat a little less than normal. Just as I don't want to binge, I also don't want to restrict too much (which usually leads to a binge!). I try to stay somewhere in the middle, without going to any extremes. 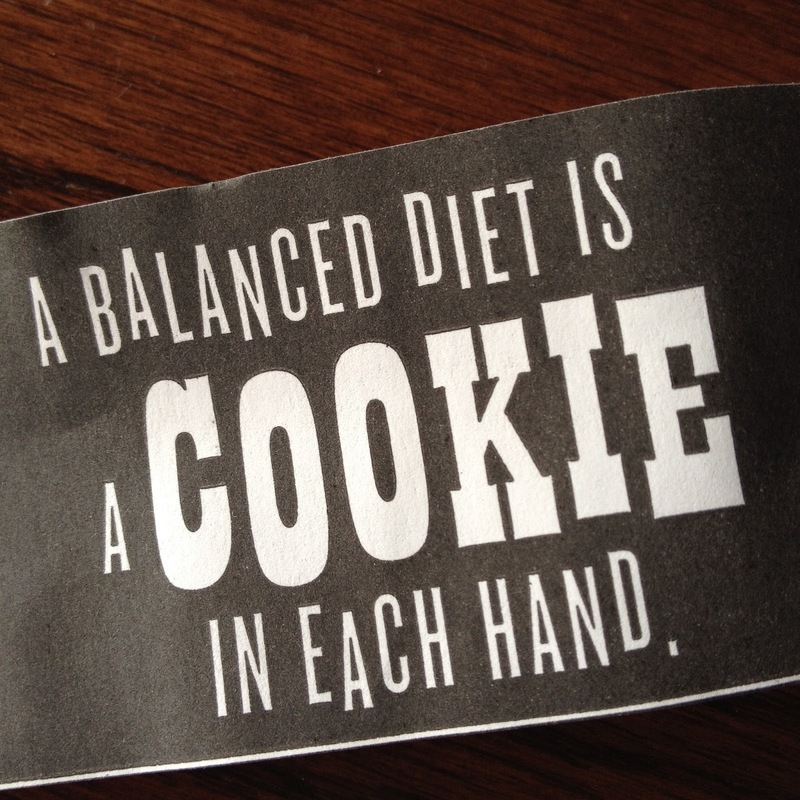 So, as simple as this whole "balance" concept is, it really works! It has saved me from a binge more times than I can count over the past several months. I know it can be difficult to grasp the idea of having so much freedom in eating (like eating whatever you want, not having a calorie "cap" each day, etc.). I was always very resistant to that kind of freedom, too. I liked cut and dry "rules" to follow, because then I knew if I was on track or not (if I went over my Points, I was off track; if I hit my target, I was on track--very clear). The way I've been eating since August, I've gotten past that mentality, and it has really helped me! My only real food "rule" is that I log my food every single day, even if I have to guesstimate the calories at times. Even on days when I plan to have high calorie foods, or splurge on dinner out, I log everything. I had tried calorie counting before, but trying to keep the calorie count to a certain number is always what threw me off in the long run. I had to guesstimate, but I still logged it! Aside from the whole balanced approach to eating, let's say that a binge does happen. It's not the end of the world! 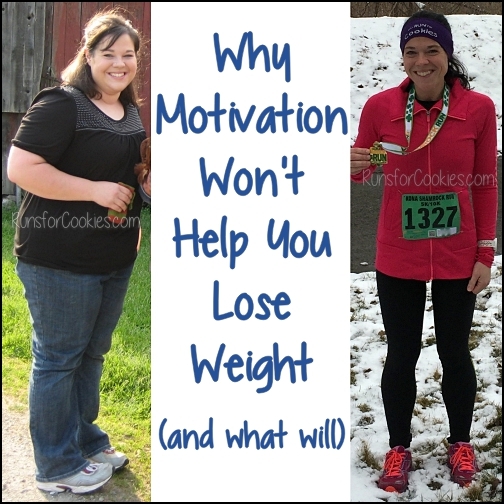 You can move past it and reach your weight loss/maintenance goals. 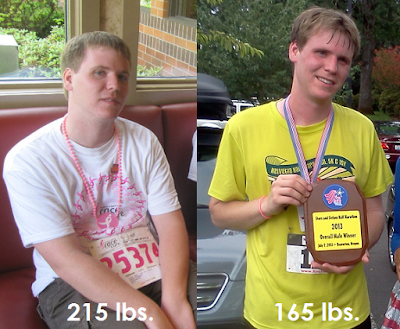 When I was losing the weight in 2009-2010, I went 365 days without a binge. On Day 366, I binged... can you imagine how different my life would be if I'd just given up that day? 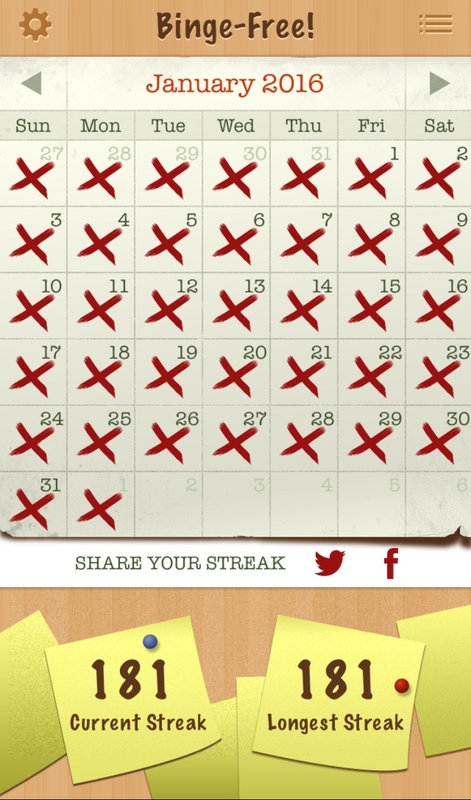 Instead of quitting, I kept trying--day after day--to start and maintain a new streak. I haven't had a streak that long since, but I'm doing really well right now (today is Day 181). 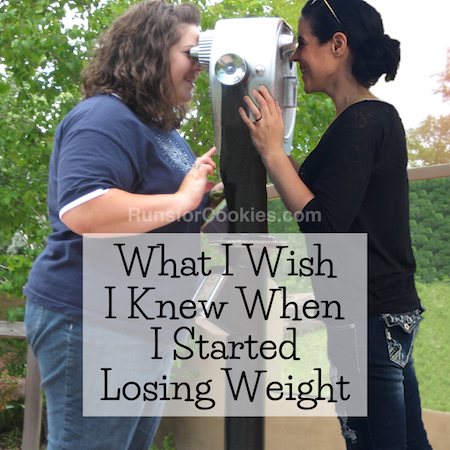 I have had many, many binges between then and now, but I never truly gave up on myself. I have picked up a few tips along the way that may help in getting back on track after a binge, so I'll share those here in case they may help someone else. Going for a walk (as awful as it may sound at the time) always makes me feel much better. It helps the food move along so I don't feel as full, and even though I don't put a dent in the calories I just ate, it does help me feel better mentally when I get in a little exercise. I put away all the food for the day/night. If there is something that is beckoning me to continue to eat, I'll either throw it away or put it in my Kitchen Safe. I always tend to feel gross after a binge, so taking a shower and brushing my teeth helps me to feel a little fresher. I drink a ton of water the next day. Aside from all the sodium and bloat going on, I want to move that food through my system as quickly as possible. I plan out my food in advance for the day after a binge, and I don't get too restrictive. Restricting too much just leads to another binge, and at that point, it's still very easy to say, "Well, I'll just have one more day, and then I'll start over tomorrow." Planning out the food ahead of time makes getting back on track less stressful. I try to stay as busy as possible, because of that "One more day" phrase that sneaks into my mind. Getting out of the house helps a lot, so I might run some errands or meet up with a friend for a walk or coffee. I make it a goal to get through just this one day without another binge. I don't think ahead to tomorrow, or the next day, or next week or next month. That gets really overwhelming! I just focus on today, and see if I can make it all day without another binge. The first week of staying binge-free is the hardest, in my opinion. I don't have enough of a streak going that it motivates me to keep it up, and it's so easy to just tell myself that I'll start over tomorrow. But, I know from experience that if I can get through that first week, it gets much easier after that! It's fun to keep a streak calendar where I check off each day that I remain binge-free, and I can see all the binge-free days in a row. Finally, I try to recognize patterns and behaviors that lead up to binge eating episodes, so that I can catch it early and hopefully prevent a binge before it happens. Once I find myself starting to think about a binge, I know that I have to do something to avoid thinking about it. Lately, I've been grabbing Joey's leash and taking him for a quick walk around the neighborhood. If not that, then I'll start a project that will keep me busy--cleaning out a closet, doing laundry, cleaning out the refrigerator, etc. My goal isn't to "prevent a binge forever", but rather to just get to the next meal without a binge. That makes it seem much more manageable. 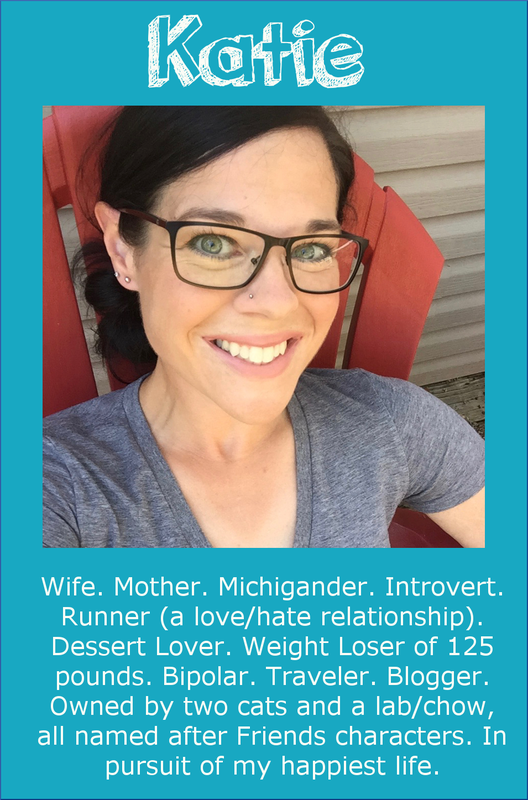 Note: I not sure if it's noticeable, but I deliberately use "I" and "me" when I write tips about things that may help for binge eating, weight loss, or diet. I do that because I want to avoid preaching by saying this is what "you" should do. I don't know you! Therefore, I don't know what is best for you. By sharing all that I have in the past four days, my hope is to just give you some ideas to try that MAY work for you. But as I always say, it's important to find your own way and do what's best for YOU. I count my calories every single day--even in maintenance, and even when I overindulge. If I was to break my binge-free streak, I would log my binge as well. I don't have a calorie "limit" each day. I just try to keep the total reasonable, or what I suspect a "normal" person might eat. I eat whatever I want. No exceptions. I eat on a schedule--breakfast, lunch, dinner, and treat, roughly four hours apart. I try to keep my calories balanced out for the most part, as I described in this post above. In a world of weight loss rules, information, to a point of mental clutter. I marvel at simplicity, straightforwardness of what works for you. Thank you for giving words to mental battles. What led you go binge on day 366? After a full year of being binge-free? This was a wonderful series, and s helpful. Thank you! Thank you so much for this post! I really needed it tonight. I'm not a binge-eater, but I go through frustrating phases of overeating, and I'm always anxious that I might not be able to go back on track, and always mad at myself for "blowing it" when I'm so close to goal. Your insights into this process always help me out. Thanks for writing!! 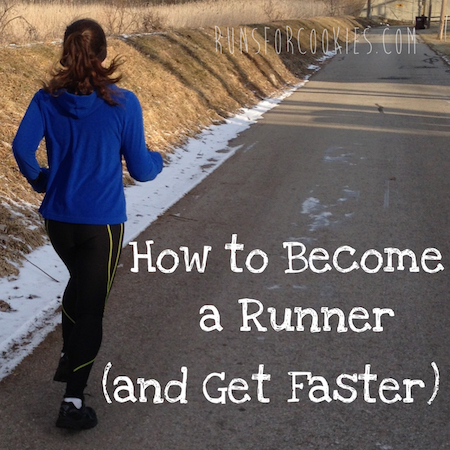 This series was SO very helpful, and this last post was the best yet. Thank you for being so honest about an issue that is usually hidden in shame, which keeps all of us who suffer from it hidden as well! Thanks for being so honest. Is struggle with this as well. I think I binge on a smaller scale but my thought process is the same as yours. So this has been helpful. I have never ever tried counting calories. I did WW a few times in my past. I was successful for a while. For me counting points led me to focus MORE on food. I would be like "how many points is this? If I eat this how many points do I have left? How many points do I need to save for dinner?" It was constant thinking about food and what I could eat and what that meant for the rest of the day. That's why I've never tried counting calories. I didn't want to get back into that mindset. I focus on food so much as it is, that the thought process I had while counting points was just not healthy. In reading your series and seeing how it aligns with my thoughts process, I'm really surprised I haven't been even "more" overweight than I was/am. Congrats on your current streak. We are all rooting for your continued success. And thanks again for being so open and honest. That's what I love about your blog. I've been reading your blog for about a year, largely because you seem to face a lot of the same issues I do and your writing style is so positive and cheerful that I find it helpful. I too am Queen of the Stress Fractures, had a clumsy fall that broke my face, and most significantly, suffer with my weight as a result of binge eating. Reading your series on it touched a bit of a nerve, I'll admit, and brought a few things back to me that I thought I'd long put to bed. I've been Binge Free for six months, and pregnant for five. I take medication for my anxiety (it's baby safe, I checked with my doctors) and have struggled with my pregnancy because it's going to put me over 200 pounds for the second time in my life. Thank you for writing, it was a nice reminder that gaining this weight isn't a death sentence, and that I'll get it off (and all the bonus weight I've picked up in the last year) by exercising and making healthy choices. And eating cookies. Thank you so much for this series. It is so nice to know that we are not alone. My thought process is pretty much identical to yours and it is a struggle to keep the streak going! Mine right now is 54 days. Thank you so much for publishing this series, Katie. The timing of it is quite perfect, because I've been struggling a lot recently. Binge eating has been an enormous part of my life for the past 10 years. I am all too familiar with the pain of BED and depression. My longest binge-free streak *ever* lasted 3 months: from October 2015 up until last week. Then I binged on 4 separate days last week, and twice so far this week. It's really starting to add up. To make matters worse, I had just reached my goal weight before all of this happened. I have no idea how much I've gained. Every night I think to myself "I can't let this happen again tomorrow". Yet it does happen. Rationally, I know that despite the damage that's already been done, if I could only get this back under control and start eating normally again, I wouldn't have that much weight to lose to get back to goal. Yet all rational thoughts abandon me when the urge to binge strikes. It is so messed up and confusing. Reading about your thoughts and experiences truly is encouraging. I hope to get back on track soon. I've been enjoying your blog for a while. I just started the process of counting calories myself and doing some exercise. Can you remind me when you started losing those 27 lbs and how long it took you? Thank you so much for your deepest thoughts. I loved these posts and can relate in every way. Katie, thank you so much for writing this! I've never had an issue with binge eating....I definitely think I overeat sometimes, but nothing that I feel is out of control. However, I still found this series very interesting. I definitely appreciate that you focus that it's what works for you, but may not work for others. Really interesting information! It is as if you are in my mind! I needed to read this today! Thanks! Thanks so much for taking the time to write these posts. Very thought provoking and helpful! Thanks for sharing! I think I have binge tendencies after ready your series. I think for me as well, there's a direct correlation with everyday stress and my anxiety. Good for you for figuring out what works in your advantage. For myself, calories (or points) counting always ends up in massive binge. Too much emphasis on the food, I become obsessive and overly anxious about it. So it's out of the equation for me. What seems to work for me is sticking to a 3 meals a day schedule (no snacks). It keeps my mind at peace. And not having sweets/desserts also brings down my cravings, so binges are less frequent. So many options, so many ways of doing things! Yes, balance. This entire series was so perfect. I think it will truly change the way I view food. Thank you! What a great series!! Thank you so much for taking the time to share this. I really do think this is going to make a difference for me! Oh, and I LOVE how you stress the point that this is what works NOW, and are very honest with the times you've gained weight back. I've been there time and time again, and each time it feels like I've failed, but I haven't given up yet - this helps me to think there is hope, and I won't just be another statistic that couldn't keep the weight off ;) if nothing else, it's another learning experience that'll help me get one step closer to finding what works for me. Thanks again, Katie!! Wow. I am a binge eater. I didn't know it. It feels good to know I'm not alone... although I would rather connect over a love of knitting (or you know, something that I actually know how to do) but it's nice to know I'm not alone. Anyway, I ramble, but thank you Katie for blogging and keeping it real. 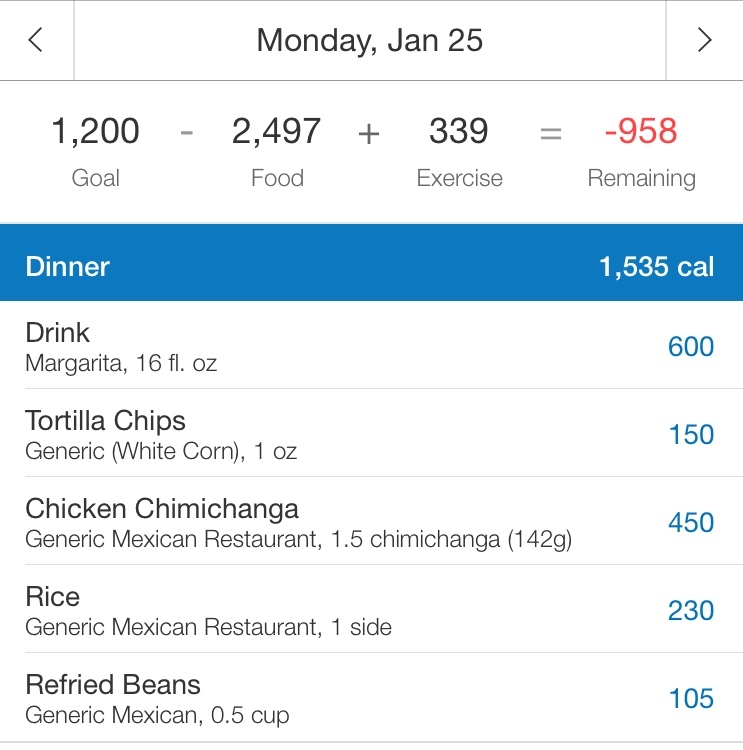 What app do you use to track your calories? This was a great series! I am currently doing WW, but once I hit "goal", I'd like to have another alternative to the point system. thanks so much for this, this was a wonderful 4 part post! Did you ever see a therapist to help with dealing with BED? Thank you for this post!! I got off track over the weekend, and came back and reread it! Hi - I'm a medical writer with a M.S. In counseling who is beginning a blog called bloodsugardown.com, geared toward people who have prediabetes. Your series on binging is the best I have ever read in that it encompasses both psychology and extensive logistics of preventing/minimizing binge eating. I will provide a link to it in my section on motivation.